But now, as researchers from the University at Buffalo and Texas A&M University report in the journal Physics of Fluids, they have developed a simple nondimensional parameter that depends on both geometry and flow waveform to classify the flow mode in both sidewall and bifurcation aneurysms. 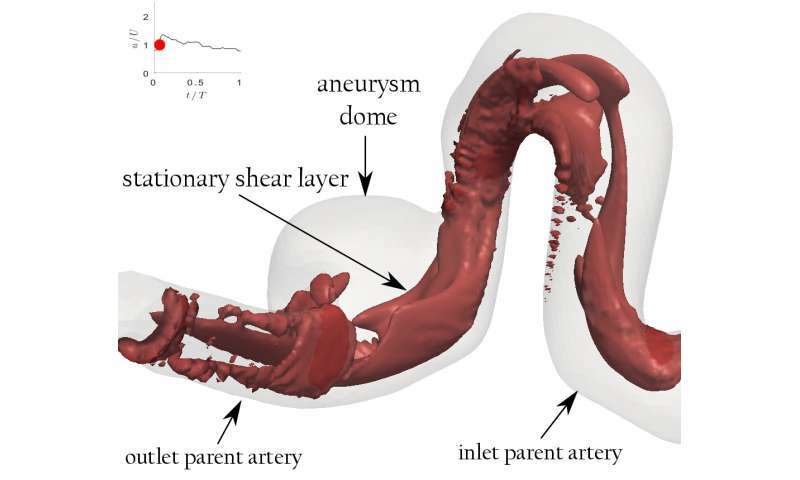 The group's work is a significant breakthrough because they were able to show that not only can their aneurysm number classify the flow mode in both simplified and anatomic geometries, but also that the oscillations of shear stress are higher in the flow in the vortex mode (An>1). "This means that our simple parameter might be a good substitute for the oscillatory shear parameter—without the need for challenging flow measurements and simulations to calculate shear on the wall," Borazjani said.